I’ve always enjoyed the behind-the-scenes perspective rather than being a member of the audience. I sympathize with Toto: while everyone else is focused on the wizard, I’d rather be the one pulling back the curtain. And so it was last night I much preferred performing in the fiafia to sitting in the crowd watching the spectacle. Then again, I think most volunteers are quite happy to not be in training anymore. The word Fiafia means happy, but it also used as a noun to mean something similar to a fiesta. It’s a party. A happy party. 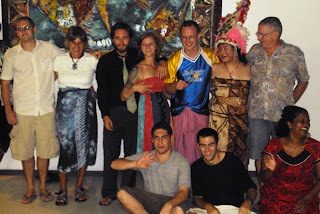 Most of the fiafias I’ve been to have been a sort of entertainment exchange. Group one performs a song or a dance or a song and dance for group two, and the group two performs for group one, and then back to group one. It’s sort of a like a we’ve-got-spirit-yes-we-do-we’ve-got-spirit-how-‘bout-you kind of thing. At our fiafia with the women’s committee in the village, there was much back-and-forth. And when the Kiwi girl’s school came to visit my school, it was the same. The problem with the newbies is they haven’t known each other long enough to have a coordinated song and dance prepared. So the Peace Corps Welcome Fiafia tends to be a little one-sided, which is cool. We can handle it. As is often the case, being in the show rather than watching the show, it becomes obvious the degree to which the entire production is haphazardly thrown together. There were small pockets of preparation—Blakey had a working set list, Trent did a lot of background research to figure out the haka, I put together the slideshow—beyond that, everything else was practiced and put together in the 24 hours leading up to the event. Thursday night a bunch of people got together to collectively remember the sasa since most of us haven’t gone through the motions since training ended in December. 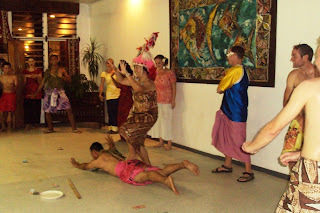 The sasa is a modified slap dance performed sitting on the floor. The dance moves mimic the making of pe’epe’e sauce, which includes climbing the tree, husking the coconut, and adding salt to taste. I missed practice, but I got up and performed the sasa at the fiafia anyway. One nice thing about the sasa (and the guys’ slap dance) is the entire dance is performed once at a medium tempo, and then the drummer speeds up and the entire dance is performed again. I say this is a nice thing because anything that’s rusty the first time around you immediately get to fix the second time—or you can screw up twice in a row. It’s up to you. The guys’ slap dance was cool save for the fact I slammed into a chair during the second go-around. I was kicking my feet up to slap them, and WHAM! into the chair I fell. Who put an effing chair there? I like to think that I stayed in character and pushed the chair off to the side with much machismo. I lightly bruised my foot in the incident, but mostly I hurt my pride. Also of note in the injury department was the part of the evening in which Casey climbed on Dan’s back in a fit of temporary bravado. Dan and Casey had both lathered themselves in coconut oil for the event (as had the rest of us) and while Casey had enough momentum to ascend Dan’s body, he was too lubricated to stay. The crowd gasped when he fell, but he came away unharmed. With the exception of some spacing issues, the girls’ dance went over just fine. 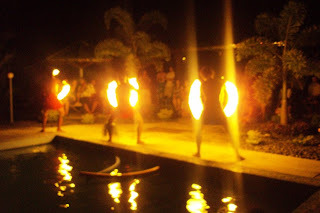 We brought in professionals for the fire dance, and my slideshow seemed to pass muster with the group. And so another Peace Corps fiafia is in the books, the last for groups 79 and 80. It’s weird to think next year’s fiafia will be group 81’s last. How quickly time passes. In any case, I hope you’re well. Pictures below. Guys lathering up in the office before the event. Koa, who missed the group lathering, attempts to glean some coconut oil from Phil. Guy's dance. Me at far left then Phil and AJ. Front row left to right: Trent, Benj, Joey, Casey, Supy, Paul. Group 79 saying goodbye. Standing left to right: Erik, Hanna, Cale, Sara, Matt, Rosie, John the Welder. On the floor: Max, Ryan, Lissa. Siva afi on the poolside. Today's post was really entertaining! I love your descriptions. Such great images. Well, except for you falling into the chair. I'm glad you are ok.
P.S. Yesterday was so very very sad. You were missed. looks like a great fiafia.